Summary: Here you will find details about the most lightweight and the cheapest quality controlled vacuum right now – the Dirt Devil SimpliStik. The Dirt Devil SimpliStik is a Bagless stick vacuum. It is vastly known for the cheap price but amazing performance. Are you looking for the CHEAPEST and the most LIGHTWEIGHT vacuum for you? As long as you are single, live in a small apartment, it will do good for all type of cleaning. It’s best for stairs, good for fur and okay for carpet. You simply cannot hate a vacuum that will cost you less than 3 Lbs bacon and weight less than your Macbook. Maybe that is why it is one of the best sellers stick vacuums. It should be under the list of best vacuum cleaner under $50, or $40. You know what, it proudly competes under the list of best vacuum under $100. Here’s Dirt Devil Simplistik for you, its performance within a sentence. Dirt Devil Simplistik focuses on affordability and convenience. It beats all other vacuums if you have the lightweight convenience in mind only. If you live in a non-carpeted small one room alone and seeking a vacuum for your tiny sweet home, No need to look for other options. A complete convenient package: Told you before, it might not be the strongest vacuum available, not near anywhere of that. But it is all about convenience. At such weight, cleaning with it should feel a walk in the park. Great for stairs: As it can be transformed into a handheld or detailed vacuum with the crevice tool on board, it can be a marvelous choice for non-carpeted stairs. The Transformers!!! Was telling about convenience. It can be easily converted into a handheld vacuum cleaner. Like the dirt devil dust buster. Bagless: It is a bagless stick vacuum. Another convenience. It can be a mess to empty it though, but you are free of the hassle of regular bag replacement. Versatile Attachment Options: This vacuum won’t disappoint you with its attachments. The crevice tool is there, which is on board. Easy to clean sharp edges, no need to keep it here and there. It is nicely homed in the main unit. 3 in 1 convertible: It is a 3-in-1 vacuum you can say. 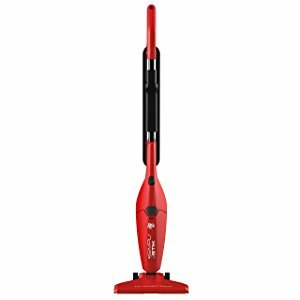 It is a stick vacuum, you can detach the upper stick portion with a simple pressing of a convenient switch and it will be a handheld vacuum. You can put the stick there and add the crevice tool, it is a detail vacuum. A very good feature. Long cord: Fairly long cord. Can easily clean a medium size home without changing the socket. What Other Customers Are Talking About It? While roaming through an ocean of praising of this Dirt Devil Simplistik, suddenly found this customers words, from Amaozn.com. A buyer pointed out a great aspect of this Dirt Devil Simplistik. He was looking for a TOY vacuum for her little girl who wanted to be like mommy and clean the home like her. She found that this ACTUAL stick vacuum named Dirt Devil Simplistik costs less than the toy one and can vacuum originally!!! Her citation is put upfront right below exactly extracted from the Amazon.com. You see? This is even perfect for your kids too, teach them vacuuming, teach them to be clean. Another buyer from the US told this vacuum as the perfect choice for little space. It might not be the most perfect for large places or home coated with thick carpets. But for small offices or two or three rooms consisting of apartments, it surely is. It has some dark side too. You simply cannot find everything perfect by paying this little. There has to be something, and yes- there is. Let’s find that out from what real buyers are saying. Let’s see if we can found a workaround of the problems. The main problem that real buyers are continuously pointing out is its durability. Everyone asking about its little lifetime. It is obviously a dark side. No matter how cheap a product is, it has to maintain some minimum build quality. Anyway, I found that it works perfectly as long as you use it for light usage. As I am saying for quite a bit of time, perfect for light usage. Since you are well aware of what other customers are saying about it, you are well known for its pros and cons by now. It can manage thin carpet though, but it will be a bad choice for thicker carpet. May suffocate to pick up large particles. Caution: NOT for heavy use. That’s it! That is all you should know about the Dirt Devil Simplistik before purchasing. If you really want to be upgraded from typical brooms and dustpans. 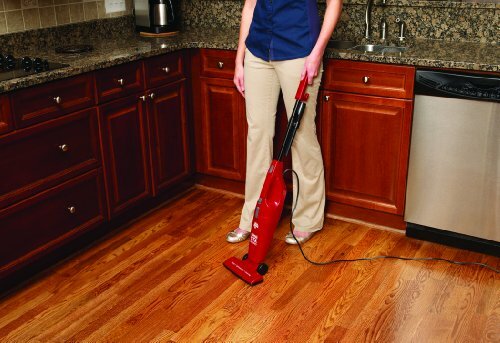 You should check the Dirt Devil SimpliStik Lightweight Vacuum Purchase One Now. Feel free to come back here anytime and share your experiences. Till then, have a great time.